Looking for an easy, healthy, casual supper this weekend? Something tasty for movie night- or a play-off game? I’ve gotcha covered. With a perennial family favorite. 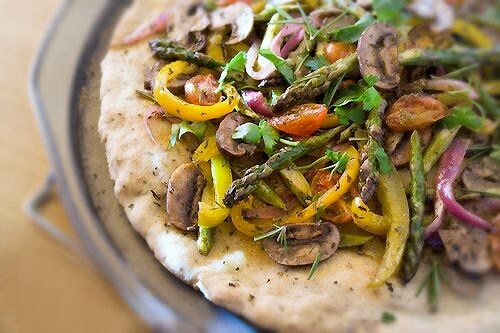 A lovely gluten-free flatbread, baked with savory herbs and garlic, topped with lots of gorgeous Italian style roasted veggies. Sprinkle with goat cheese (or your favorite Italian blend of cheeses) and drizzle with your best extra virgin olive oil. There won’t be a scrap left over.